AmeriCorps LEAP (Learning Early Achieves Potential) Initiative members serve in preschool classrooms and nonprofit organizations focused on the social and emotional development of young children in our 20-county region. We recruit, connect, and match members to site service partner positions to help work one-on-one with children who are at-risk of falling behind. Members begin the LEAP service term in August and serve through the following July. Individuals interested in this program may contact Barbara Gunderson, AmeriCorps Director, at 507-455-3215 or barbarag@smifoundation.org. We're accepting member applications for 2019 - 2020 - apply today! Rolling enrollment until filled. I still find the work I did with AmeriCorps on social/emotional skill building to be very relevant in the work that I do with kids and even adults. Because of my experience in AmeriCorps, I'm able to bring the knowledge that I've gained to other aspects of my life: my work, my relationships, my well-being, and share that with others. Lindsey Schaefer, serving in her second year with the AmeriCorps LEAP Initiative in southern Minnesota, ended the year with a service project called "Kindness Rocks". She facilitated rock painting in her morning and afternoon classes at the Head Start Preschool in Saint Peter, MN. After the rocks were finished the group read Have You Filled a Bucket Today? by Carol McCloud, a book on sharing kindness through small actions. The group then cleaned up the trash on the playground at the St. Peter Community Park and placed the painted rocks where they found litter, showing the preschoolers that being kind and helping the neighborhood community can be fun. 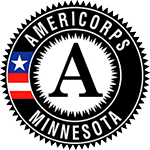 The LEAP Initiative is an AmeriCorps program made possible through the Southern Minnesota Initiative Foundation—Early Childhood Development partnership with ServeMinnesota and the Corporation for National and Community Service. We are committed to recruiting and engaging individuals without regard to disability, gender, race, religion or sexual orientation. Reasonable accommodations provided upon request. Document available in alternative formats.